Feeders: When you send a feeder you send two gifts: the feeder itself, and the moment it arrives. There's the knock at the door or the package on the porch. And the next thing that happens is your special someone's heart races with delight as they open a gift they will remember for years to come. Feeder Delivery: At Hurley-Byrd, we do things differently and oversee every part of the process: from the buying of raw materials, to handcrafting the feeder, to the day your purchase arrives at the front door. We send freshly crafted feeders direct and bypass all the middlemen, which means better feeders and a better value. (Don't just take our word for it. Thousands of customers rate Hurley-Byrd "best value.") We believe in complete satisfaction and lasting value, too, which is why we guarantee a perfect feeder for you or your recipient , and also that your feeders will oulast all others available and will be enjoyed from the moment they arrive and for years to come. It's all part of how Hurley-Byrd is changing how America feeds their wildlife. 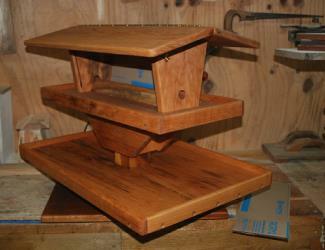 Hurley-Byrd does it differently: We handcraft each and every feeder we sell. Beginning with our own designs, buying the finest western red cedar and crafting your feeders to near perfection with a beautiful penetrating oil finish so they last for years. We take pride in every step of our service, too--from the moment you first interact with us, whether on our website or on the phone, to the delivery of your feeders and gifts and everything in between. We want to make owning and gift giving easy for you. So whether it's a simple thank you gift, a unique deer feeder or a whole feeding station for yourself, choose Hurley-Byrd and see what a difference our feeders really make. The Hurley-Byrd Bird Feeder Co. This is a representative of what we will build you. amazingly gorgeous like all of our feeders. The First "Take-off" from the Original Mourning Dove - UPWARD in Capacity. Upon introducing the Original Mourning Dove, our customers requested "more capacity." Our response was the Ultra Mourning Dove (UMD) with 50% larger hopper meeting their needs. "bird feeder" look and 4 1/2 gallon (18 lbs) capacity, it sets off any feeding station and the birds feed all day. Feeder Dimensions less mount: 29" in length, 16" in width, 11" in height. Mount adds 6" in height. Light Assembly Required - Attach Roof, 4 screws. Attach mount, 8 screws. Very Easy! The First of the New 2009 Introductions - It's a STRETCHED Mourning Dove. Mourning Dove's near perfect configuration and s-t-r-e-t-c-h-i-n-g its length, the new Extra Long Mourning Dove takes first prize with its gorgeous appearance and 3.8 gallon (15 lbs) capacity. This is an extremely serious feeder and with its ample (and long) feed platform, you'll have the happiest birds in town. Feeder Dimensions less mount: 32" in length, 16" in width, 10" in height. Mount adds 6" in height. Our BIGGEST feeder goes HUGE!!!! - Topped only by our custom built Million Bird Byrd Feeders. If you have been seeking a LARGE (make that HUGE) capacity bird feeder, look no further. The Extra Long Ultra Mourning Dove's design is all about beauty with quantity. 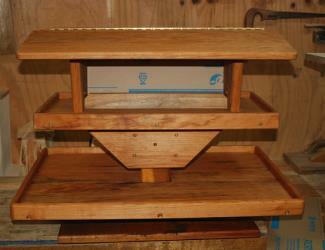 Holding 6.2 gallons (25 lbs) of seed, this feeder will make for happy birds and you won't fill as often. This is the perfect bird feeder for those on a busy schedule or having very large populations of birds. Feeder Dimensions less mount: 36" in length, 18" in width, 11" in height. Mount adds 6" in height. 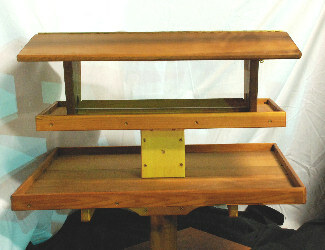 Optional Matching Seed Catcher Tray - 36" in length x 24" width. One of Our Most Exciting 2009 Introductions - A Small-Pole-Mounted Large Feeder. A Hurley-Byrd First. 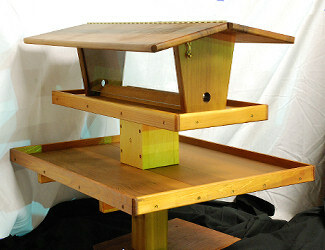 feeder, pole mount and high quality cedar pole in one package. perfectly and will make a beautifully diverse feeding station. Mini Mourning Dimensions: 24" in length, 16" in width, 10" in height. Mount adds 6" in height. Extra Large Blue Jay Dimensions: 24" in length, 16" in width, 10" in height. Mount adds 6" in height. Light Assembly Required - Attach the mount using 4 supplied screws. Very Easy! The Hurley-Byrd Mourning Dove series bird feeders are in a class all their own. Our years of birding and woodworking expertise produce the finest large bird feeder available. Through a process of continued enhancement, the Mourning Dove's functionality and beauty have reached a level unequalled in the bird feeding world. It is pure Form over Function - The BWM of bird feeders. feeding station or a gift that will never be forgotten, look no further. continued for nearly 10 years until lumber supplies dictated a hiatus for the MD line. each with and without Pole Mounts and/or Matching Seed Catcher Trays. saves YOU lots of "seed money" ultimately paying for itself and the feeder too. cannot be hung due to their weight. But they can be used as patio table, deck, ground or stump feeders. and secured at any location along the poles length using the supplied brass screws. Western Red Cedar - The finest cedar in the world. See our Word About Wood page (a must read). 1.) Super thick base plates and vertical roof supports for years of durability. 2.) 3/4" Matched lumber roof halves of superior beauty. 3.) 1/2" thick railings to hold up to years of birding activity. Solid Brass Screws - Used Throughout. No inferior staples, nails or brads found anywhere. 1.) Screws are the ultimate fastener for their holding capabilities. 2.) Brass will not corrode like nails, staples, or inferior screws. 3.) Screws allow disassembly for cleaning, refinishing or repair. Hopper End Seed Ports - Supplies seed to feeder's ends producing a 360 degree feeding environment. Full Length Brass Plated Roof Hinges - Keeps rain and melting snow from entering the hopper. Heavy Duty 1/4" Acrylic Sheeting - Double thick sheeting retains it shape and is strong! Positive Water Drain Holes - Placed at each corner for fast drainage of rain and melting snow. Hopper Base Seed Splitter - Directs ALL the seed to the feeding platform. Solid Brass Hook and Eye Latch - Positively keeps the roof closed, even in high winds. See the left and right side bars for additional feeder information. The Mourning Dove shown to the right is the forth largest feeder with a seed capacity of 3 gallons (12 pounds) and is also the forth shortest of the series. Make no mistake, this IS NOT a small feeder. The Original Mourning Dove is perfect for those looking to set up their first feeding station or anyone needing a high capacity filler feeder and wants the quintessential looking large bird feeder. This is a superb choice. hopper is shaped differently than the regular Mourning Doves. very substantial seed holding capacity for the convenience of less filling and assures there is ample feed for your birds at all times. If you seek a large capacity feeder and live in an area having heavy snowfalls or receive abnormal amounts of high winds, this is the feeder you need. It's roof holds less snow and due to its more centralized center of gravity, will be less prone to weigh and wind damage. Click on the name and size of feeder you need for your home to jump to that exact feeder. Seed Catcher Tray for Mourning Dove: 30" length, 20" width and has a center hole that slips over your 4x4 pole. Hardware included. Heavy Duty Mount and which do I need? Each Hurley-Byrd 4x4 pole mount is an extremely strong mount. You will not find a stronger and more beautiful mount on the market anywhere. Each mount is crafted of the finest lumbers suiting the feeder's weight requirements. purchase the heavier of the two mounts. Seed Catcher Tray for the Ultra Mourning Dove: 30" length, 20" width and has a center hole that slips over your 4x4 pole. Hardware included. 32" x 24" Seed Catcher Tray slips over your 4x4 pole and mounts anywhere you desire along the poles length. Hardware included. largest in the series with a 3.8 gallon (15.4 pound) capacity, yet it's our second longest feeder offering more room (in a linear fashion) for the birds to feed. a more ample feeding platform for the birds but reduces the feeder's seed holding capability. but still falls short of both Ultra Mourning Doves. looking" bird feeder, here it is. With its roomy feed platform and strongly "V" shaped hopper, this feeder's versatility and beauty are second to none. Six Square Foot Tray for ELUMD. Measures: 36" length, 24" width. Comes with installation hardware. Simple and easy assembly required. This feeder is too heavy for a Large Pole Mount. 24" x 16" Seed Catcher Tray slips over our cedar pole and mounts anywhere you desire along the poles length. Hardware included. Matched Set of 1-Mini Mourning Dove and 1-Extra Large Blue Jay. Add 2 - Matching Seed Catcher Trays to the above offer. Add the massive 6 square foot seed tray and it makes a major statement in any yard. The Mini holds 2 1/2 gallons or 10 pounds of seed and since its weight is centered over the mount, a small pole mount and 1 1/2" square pole can be used for erecting this feeder. Add the Extra Large Blue Jay fly-through and you have a beautifully matched set of feeders that will cater to a wide variety of birds. Sign up for our free Newsletter filled with fun facts, new products and be eligible to win a Free Feeder every month. Furniture for Your Feathered Friends!